SMF (Sealed Maintenance Free) batteries also known as the Value Regulated Lead Acid (VRLA) batteries are the flat plate batteries that do not require topping-up and normally do not emit any fumes or gases on a continuous basis. They are completely sealed and therefore eliminate the risk of acid spillage during transportation. Due to their construction it can be mounted in any orientation and do not require constant maintenance. These are used for high end applications of standby power like UPS, Electric Converter, Railway Communications, Security Systems etc. 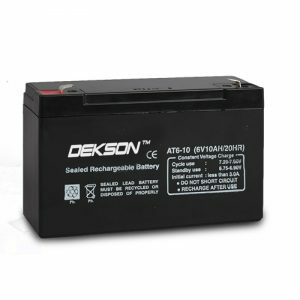 Dekson AGM VRLA Batteries are high quality, maintenance free batteries produced at state of the art manufacturing facility with advanced battery manufacturing technologies and with high purity grade of raw materials. 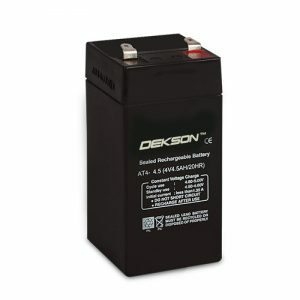 These batteries have long float and cyclic life span, super high specific gravity and ultra low self discharge. 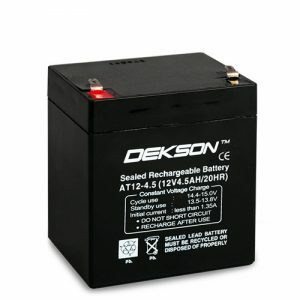 Battery container is completely sealed, leak proof and can be placed in any direction to operate. It has excellent anti corrosion properties and it performs flawlessly in variable climatic conditions. 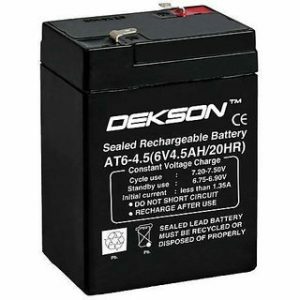 Dekson AGM VRLA Batteries have design life ranging from 5 to 10 years and it is suitable for multiple applications. 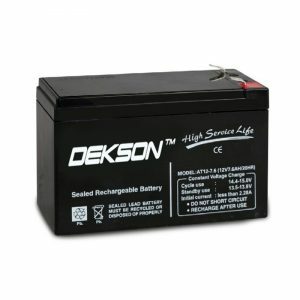 Dekson provides you a wide range of 12V SMF batteries based on the capacity at 20hr(AH), ranging from 7.2 Ah to 200 Ah, Certified by ETDC. It promises you a Genuine Quality Product, which tops in six Stigmatic tests. Specially designed vent valves – For opening and closing at a specified pressure to release extra gas, while simultaneously retaining the required electrolyte quantity in the battery. Tough ABS Containers – Aesthetically designed and fabricated in tough ABS containers for increased durability. Imported Absorbent Glass Mat – For higher electrolyte immobilization and retention to prevent dry out. Special Lead-tin-calcium alloy – Made using special lead-tin-calcium alloy and special paste formulation to minimize gas emission and prevent water loss. Gas combination technology – Made using the latest gas recombination technology with no emission of fumes.